Lariat, FX4 OFFROAD PKG., LARIAT SPORT PKG., LONG BOX. Looking for a clean, well-cared for 2016 Ford Edge? This is it. This Ford includes: TRANSMISSION: 6-SPEED SELECTSHIFT AUTOMATIC (STD) Transmission w/Dual Shift Mode A/T 6-Speed A/T EQUIPMENT GROUP 301A Heated Steering Wheel Floor Mats Blind Spot Monitor Cross-Traffic Alert BRONZE FIRE METALLIC TINTED CLEARCOAT CANADIAN TOURING PACKAGE Panoramic Roof Navigation System Generic Sun/Moonroof Sun/Moonroof Dual Moonroof CLASS II TRAILER TOW PACKAGE W/TRAILER SWAY CONTROL Tow Hitch EBONY, UNIQUE PERF LEATHER HEATED/COOLED SPORT SEATS Heated Rear Seat(s) Cooled Front Seat(s) Seat Memory Power Passenger Seat Power Driver Seat Heated Front Seat(s) Passenger Adjustable Lumbar Leather Seats Driver Adjustable Lumbar Bucket Seats ENGINE: TWIN-SCROLL 2.0L I4 ECOBOOST 4 Cylinder Engine Gasoline Fuel Turbocharged *Note - For third party subscriptions or services, please contact the dealer for more information. * This Ford Edge Titanium has a tough exterior complemented by a well-designed interior that offers all the comforts you crave. The Ford Edge Titanium's pristine good looks were combined with the Ford high standard of excellence in order to make this a unique find. Few vehicles can match the safety and comfort of this AWD Ford Edge Titanium. With enhanced performance, refined interior and exceptional fuel efficiency, this AWD Ford is in a class of its own. Added comfort with contemporary style is the leather interior to heighten the quality and craftsmanship for the Ford Edge You can take the guesswork out of searching for your destination with this Ford Edge Titanium's installed Navigation system. This outstanding example of a 2013 Lincoln Navigator is offered by Cypress Motors. This Lincoln includes: STONE, LEATHER TRIMMED FRONT LOW BACK BUCKET SEATS Leather Seats Bucket Seats INVISION HEADREST DVD SYSTEM Entertainment System 5.4L SOHC 24-VALVE V8 FFV ENGINE (STD) Flex Fuel Capability 8 Cylinder Engine 6-SPEED AUTOMATIC TRANSMISSION W/OD (STD) A/T 6-Speed A/T WHITE PLATINUM METALLIC TRI-COAT STANDARD PAINT POWER CODE REMOTE START SYSTEM (DIO) Remote Engine Start *Note - For third party subscriptions or services, please contact the dealer for more information. * The Lincoln Navigator offers a fair amount of utility thanks to its advanced features and unique styling. It's also quite sporty, and injects an ample amount of handling chutzpah into the ridin'-high body of a family-friendly SUV. This Lincoln Navigator 's level of quality is not meant for just anyone. It's meant for the person who strives for a classy, comfortable, and luxurious car. Handle any terrain with ease thanks to this grippy 4WD. Whether you're on a slick pavement or exploring the back country, you'll be able to do it with confidence. HD quality video and studio grade sound are just a few platinum level features the entertainment package of this vehicle boasts. Added comfort with contemporary style is the leather interior to heighten the quality and craftsmanship for the Lincoln Navigator This Lincoln Navigator offers the most up-to-date navigation system available so you'll always know the most efficient route to where you are going. Cypress Motors is honored to present a wonderful example of pure vehicle design... this 2013 Lincoln Navigator only has 118,639km on it and could potentially be the vehicle of your dreams! This Lincoln Navigator is an incredibly versatile vehicle that is a "must have" for any family. Opulent refinements married with exceptional engineering make this the kind of car you'll want to own for a lifetime. This 4WD-equipped vehicle handles any condition on- or off-road with the sure footedness of a mountain goat. With unequaled traction and stability, you'll drive with confidence in any weather with this White 2013 4WD Lincoln Navigator . Marked by excellent quality and features with unmistakable refined leather interior that added value and class to the Lincoln Navigator The Lincoln Navigator has a navigation system installed, so you'll always know where you're going. This top-tier navigation system is reliable and will get you to your destination quickly and by the most efficient route available. 2015 Ford F-150 Lariat, FX4 OFFROAD PKG., LARIAT SPORT PKG., LONG BOX. THIS 2011 Ford F- 150 4x4 SUPERCREW 157"WB LARIAT SERIES IS LOCATED IN MAPLE CREEK, SK. OPTION ON THIS UNIT ARE 3.31 ELECTRONIC LOCK RR AXLE, VOICE-ACTIVATED NAVIGATION, SYNC VOICE ACTIVATED SYSTEM, FOG LAMPS, REAR W/PRIVACY DEFROSTER, REMOTE START, KEYLESS ENTRY/KEY PAD, POWER ADJUSTEMENT W/MEMORY PEDALS, A/T/C, P/L, P/S, P/W, HEATED SEATS, HEATED MIRRORS, CRUISE, BLUETOOTH, TRAILER BRAKE, AND MUCH MORE. LOCATED AT MAPLE CREEK, CALL DALE OR CORY AT (306)662-2617 OR CONTACT US ON LINE FOR MORE INFORMATION OR TO BOOK YOUR TEST DRIVE! WE FINANCE! ON SITE BANKING SOLUTIONS! A ONE STOP SHOP WITH SALES & SERVICE. SERVING THE SOUTHWEST FOR 45 YEARS. This 2014 Ford F-150 Lariat is offered to you for sale by Cypress Motors in Swift Current, SK! This Ford includes: WHEEL WELL LINER TRANSMISSION: ELECTRONIC 6-SPEED AUTOMATIC EQUIPMENT GROUP 501A MID REARVIEW CAMERA TRAILER BRAKE CONTROLLER BLACK, LEATHER-TRIMMED 40/20/40 SPLIT BENCH SEAT 3.31 AXLE RATIO WHEELS: 18" BRIGHT CHROME-CLAD ALUMINUM Aluminum Wheels Wheel Covers 6" CHROME ANGULAR RUNNING BOARDS ELECTRONIC LOCKING SPRAY-IN BED LINER ENGINE: 3.5L V6 ECOBOOST LARIAT CHROME PACKAGE INGOT SILVER METALLIC At home in the country and in the city, this 2014 4WD Ford F-150 Lariat has been wonderfully refined to handle any occasion. Smooth steering, superior acceleration and a supple ride are just a few of its qualities. Marked by excellent quality and features with unmistakable refined leather interior that added value and class to the Ford F-150! *Cypress Certified (90 Day - 5,000km Warranty on qualified Pre-Owned) *No Pressure, Non Commissioned Sales Team *Easy Approval! *We Deliver! *One Stop Shop with Sales, Service, Vehicle Rentals and Autobody under one roof. *Serving Southwest Saskatchewan for 40+ Years! *3 Month Free Trial of SiriusXM Canada on equipped vehicles Contact Us for more information or to book your test drive today! Cypress Motors is honored to present a wonderful example of pure vehicle design... this 2016 Ford Edge Sport only has 30,000km on it and could potentially be the vehicle of your dreams! This Ford includes: DRIVER'S PACKAGE 2 Adjustable Steering Wheel Power Steering WHEELS: 20" POLISHED ALUMINUM Aluminum Wheels STANDARD PAINT VOICE-ACTIVATED NAVIGATION SYSTEM Navigation System WHITE PLATINUM METALLIC TRI-COAT COLD WEATHER PACKAGE Heated Steering Wheel Floor Mats CANADIAN TOURING PACKAGE Panoramic Roof Navigation System Generic Sun/Moonroof Sun/Moonroof Dual Moonroof TRANSMISSION: 6-SPD SELECTSHIFT AUTO W/SPORT MODE (STD) Transmission w/Dual Shift Mode A/T 6-Speed A/T ENGINE: 2.7L V6 ECOBOOST V6 Cylinder Engine Gasoline Fuel Turbocharged EQUIPMENT GROUP 401A Heated Rear Seat(s) Variable Speed Intermittent Wipers Lane Departure Warning Cooled Front Seat(s) Automatic Parking Lane Keeping Assist Heated Steering Wheel Intermittent Wipers Floor Mats Adjustable Steering Wheel Heated Front Seat(s) HID headlights Blind Spot Monitor Cross-Traffic Alert Rain Sensing Wipers *Note - For third party subscriptions or services, please contact the dealer for more information. * Do so much more with one vehicle. This Ford Edge gives you everything you need an automobile to be. Sophistication & understated luxury comes standard on this Ford Edge Sport. Well-known by many, the Edge has become a household name in the realm of quality and prestige. Enjoy driving? Well now you will get more thrills behind the wheel thanks to the heightened performance of AWD. Better handling. Better traction. Better driving experience. This low mileage Ford Edge has barely been touched. It's the next best thing to buying new. 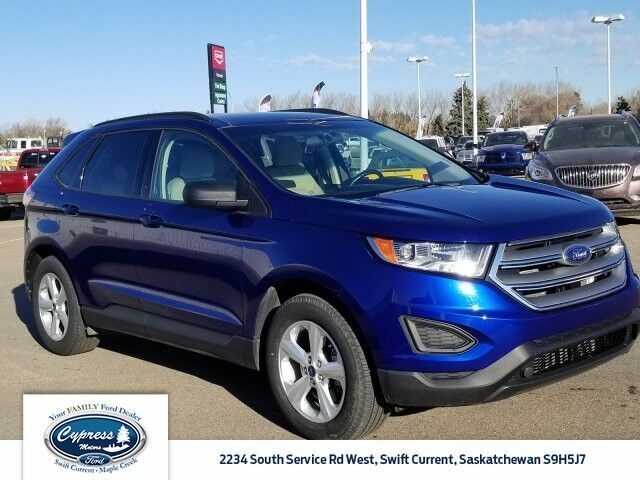 Marked by excellent quality and features with unmistakable refined leather interior that added value and class to the Ford Edge Find the quickest driving route in this Ford Edge Sport using the installed navigation system. This nav system is one of the easiest to use and will help get you where you need to go quickly! This outstanding example of a 2016 Ford Edge Sport is offered by Cypress Motors. Enjoy an extra level of calm when purchasing this Ford Edge Sport, it's a CARFAX One-Owner. The CARFAX report shows everything you need to know to confidently make your pre-owned purchase. This Ford Edge Sport defines excellence in an SUV. It has the convenience of limitless boundaries paired with city sophistication. Is it possible to fall in love with a vehicle? It is when your vehicle is as prestige as the Ford Edge. This AWD-equipped vehicle will handle beautifully on any terrain and in any weather condition your may find yourself in. The benefits of driving an all wheel drive vehicle, such as this Ford Edge Sport, include superior acceleration, improved steering, and increased traction and stability. The Edge Sport is well maintained and has just 30,000km. This low amount of kilometers makes this vehicle incomparable to the competition. Intricately stitched leather and ergonomic design seats are among the details in which test drivers say that Ford Edge is in a league of its own Well-equipped, well-cared for and still covered under the manufacter's factory warranty. Driver and passengers will celebrate the comfort and convenience this Ford Edge offers with its well-considered features. This Ford Edge is equipped with navigation, so you no longer have to wonder if you're headed in the right direction. Looking for a clean, well-cared for 2017 Ford F-150? This is it. This Ford includes: TRAILER TOW PACKAGE Back-Up Camera Trip Computer Tow Hitch SKID PLATES INTEGRATED TRAILER BRAKE CONTROLLER TAILGATE STEP W/TAILGATE LIFT ASSIST EQUIPMENT GROUP 302A LUXURY Steering Wheel Audio Controls Remote Engine Start Smart Device Integration Integrated Turn Signal Mirrors Chrome Wheels Power Mirror(s) Auto-Dimming Rearview Mirror Rear Parking Aid Back-Up Camera Heated Mirrors Leather Steering Wheel Power Passenger Seat Power Driver Seat Heated Front Seat(s) Trip Computer Tires - Rear All-Terrain Tow Hooks Tow Hitch Adjustable Pedals Passenger Adjustable Lumbar Running Boards/Side Steps Driver Adjustable Lumbar Tires - Front All-Terrain MP3 Player VOICE-ACTIVATED NAVIGATION Navigation System XTR PACKAGE Chrome Wheels Tires - Rear All-Terrain Tow Hooks Running Boards/Side Steps Tires - Front All-Terrain ENGINE: 3.5L V6 ECOBOOST V6 Cylinder Engine Gasoline Fuel Turbocharged TRANSMISSION: ELECTRONIC 10-SPEED AUTOMATIC A/T 10-Speed A/T OXFORD WHITE ELECTRONIC LOCKING Locking/Limited Slip Differential MEDIUM EARTH GREY, CLOTH 40/20/40 FRONT SEAT Split Bench Seat Cloth Seats Passenger Adjustable Lumbar Driver Adjustable Lumbar *Note - For third party subscriptions or services, please contact the dealer for more information. * Opulent refinements married with exceptional engineering make this the kind of car you'll want to own for a lifetime. When Ford created this vehicle with 4 wheel drive, they immediately enhanced the performance ability. Easily switch between two and four wheel drive to take advantage of the improved steering and superior acceleration. A Ford with as few kilometers as this one is a rare find. This F-150 XLT was gently driven and it shows. You'll quickly realize how much you will need a navigation system once you are stopping for directions or looking up addresses on your phone instead of looking at the road. This Ford F-150 XLT features a navigation system that will free you of these unnecessary headaches. Cypress Motors is excited to offer this 2015 Ford F-150. This Ford includes: INTEGRATED TRAILER BRAKE CONTROLLER TRANSMISSION: ELECTRONIC 6-SPEED AUTOMATIC Transmission w/Dual Shift Mode A/T 6-Speed A/T ELECTRONIC LOCKING Locking/Limited Slip Differential TAILGATE STEP W/TAILGATE LIFT ASSIST ACTIVE PARK ASSIST Automatic Parking FX4 OFF-ROAD PACKAGE EQUIPMENT GROUP 502A LUXURY Heated Rear Seat(s) Variable Speed Intermittent Wipers Integrated Turn Signal Mirrors HD Radio Chrome Wheels Navigation System Power Mirror(s) CD Player Heated Steering Wheel Intermittent Wipers Auto-Dimming Rearview Mirror Universal Garage Door Opener Heated Mirrors AM/FM Stereo Adjustable Steering Wheel Satellite Radio Tow Hooks Blind Spot Monitor Premium Sound System 8 Cylinder Engine Auxiliary Audio Input Gasoline Fuel Cross-Traffic Alert Running Boards/Side Steps Rain Sensing Wipers MP3 Player INFLATABLE REAR SAFETY BELTS Seatbelt Air Bag POWER-DEPLOYABLE RUNNING BOARDS Power Retractable Running Boards Running Boards/Side Steps BLACK, LEATHER-TRIMMED BUCKET SEATS Cooled Front Seat(s) Seat Memory Power Passenger Seat Power Driver Seat Heated Front Seat(s) Passenger Adjustable Lumbar Leather Seats Driver Adjustable Lumbar Bucket Seats ENGINE: 3.5L V6 ECOBOOST V6 Cylinder Engine Gasoline Fuel Turbocharged LARIAT CHROME APPEARANCE PACKAGE Chrome Wheels Tow Hooks Running Boards/Side Steps MAX TRAILER TOW PACKAGE Locking/Limited Slip Differential GUARD METALLIC TECHNOLOGY PACKAGE Lane Departure Warning Lane Keeping Assist *Note - For third party subscriptions or services, please contact the dealer for more information. * You appreciate the finer things in life, the vehicle you drive should not be the exception. Style, performance, sophistication is in a class of its own with this stunning Ford F-150. Do you encounter heavy snow, rain or mud when driving? No problem. With this vehicle, you've got the power of 4WD to help you overcome the toughest terrain. Marked by excellent quality and features with unmistakable refined leather interior that added value and class to the Ford F-150 This vehicle comes with a navigation system. That doesn't mean you won't get lost. But it does mean you won't stay lost. Thank you for visiting another one of Cypress Motors's online listings! Please continue for more information on this 2016 Ford F-150 Lariat with 90,000km. This 2016 Ford F-150 Lariat is located in Swift Current, SK! This Ford includes: TRANSMISSION: ELECTRONIC 6-SPEED AUTOMATIC Transmission w/Dual Shift Mode A/T 6-Speed A/T LED SIDE-MIRROR SPOTLIGHTS EQUIPMENT GROUP 501A MID Integrated Turn Signal Mirrors HD Radio Navigation System Power Mirror(s) CD Player Auto-Dimming Rearview Mirror Universal Garage Door Opener Heated Mirrors AM/FM Stereo Satellite Radio Blind Spot Monitor Premium Sound System Auxiliary Audio Input Cross-Traffic Alert MP3 Player ENGINE: 5.0L V8 FFV Flex Fuel Capability 8 Cylinder Engine INTEGRATED TRAILER BRAKE CONTROLLER MAGNETIC BLACK, LEATHER-TRIMMED BUCKET SEATS 3.55 AXLE RATIO (STD) ELECTRONIC LOCKING Locking/Limited Slip Differential VOICE-ACTIVATED NAVIGATION Navigation System SPRAY-IN BEDLINER Bed Liner WHEELS: 18" 6-SPOKE MACHINED-ALUMINUM Aluminum Wheels BLIND SPOT INFORMATION SYSTEM (BLIS) Blind Spot Monitor Cross-Traffic Alert This Ford F-150 Lariat's level of quality is not meant for just anyone. It's meant for the person who strives for a classy, comfortable, and luxurious car. Want to brave the road less traveled? You'll have the 4WD capabilities to do it with this vehicle. Added comfort with contemporary style is the leather interior to heighten the quality and craftsmanship for the Ford F-150 Drive any city's streets like you've lived there all your life using the navigation system on this Ford F-150. *Cypress Certified (90 Day - 5,000km Warranty on qualified Pre-Owned) *No Pressure, Non Commissioned Sales Team *Easy Approval! *We Deliver! *One Stop Shop with Sales, Service, Vehicle Rentals and Autobody under one roof. *Serving Southwest Saskatchewan for 40+ Years! *3 Month Free Trial of SiriusXM Canada on equipped vehicles Contact Us for more information or to book your test drive today! THIS 2015 FORD F-150 4X4 PLATINUM 145"WB 3.5L V6 ECOBOOST ENGINE ELECTRONIC 6-SPD AUTO, 3.55 ELECTRONIC LOCK RR AXLE, IS LOCATED IN MAPLE CREEK, SK. OPTION ON THIS UNIT ARE NAVIGATION, REMOTE KEYLESS ENTRY/KEYPAD, AMBIENT LIGHTING, LEATHER STEERING WHEEL, AND SHIFTER KNOB, POWER ADJUSTABLE PEDALS, PREMIUM LEATHER SEATS, SONY BRANDED AUDIO, SYNC VOICE ACTIVATED SYSTEM, FOG LAMPS & FRONT TOW HOOKS, LED HEADLAMPS, LED TAIL LIGHTS, POWER DEPLOY RUNNING BOARDS, REMOTE RELEASE TAILGATE, TRAILER TOW PKG. AND MUCH MORE. LOCATED AT MAPLE CREEK, CALL DALE OR CORY AT (306)662-2617 OR CONTACT US ON LINE FOR MORE INFORMATION OR TO BOOK YOUR TEST DRIVE! WE FINANCE! ON SITE BANKING SOLUTIONS! A ONE STOP SHOP WITH SALES & SERVICE. SERVING THE SOUTHWEST FOR 45 YEARS.